Ryan Caballero: I feel ready, more developed and more determined! More than a year after making his professional debut, 19 year old Ryan Caballero admits that despite a dominate four round victory in 2012 he may have not been fully ready to make the transition from the amateurs to the pros. Ryan, the younger brother to undefeated bantamweight prospect Randy Caballero also stated that he does’t feel much added pressure following in his brother’s footsteps. DS: You had your pro debut and did a good job, what was that like? Caballero: It was exciting, I wasn’t nervous walking in but when I stepped in the ring I looked around and was like Whoa… this is real. It shocked me and I got a little nervous but once the bell rang, I got in my zone and got ready for the fight. DS: This time around you got the nerves out, do you feel a little better going into this fight? Caballero: I feel more ready. I trained harder and my dad pushed me harder for this fight. DS: What’s it like coming from a family of fighters? Caballero: Growing up, fighting around the house, all boys, made us tough. Tough enough to step in the ring. DS: In your pro debut, two of your brothers fought on that card. It was you Randy and your younger brother Rommel, how was that? All three of you getting victories on the same day. Caballero: It felt like another amateur fight. Like when we all went out to fight. It was exciting to have my brother come back to the locker room and say “I won”. Then I was next and when I stepped out of the ring with the win, I waited for my brother to fight and he won. Everybody that was there, were there for us. That was very exciting. DS: What made you want to turn pro? Caballero: I was fighting in the amateurs and as I grew older, the fights weren’t the same. Having a lot of amateur fights is good but it just didn’t feel the same as when my brothers were around. When my older brother Robert was around, the fights were more exciting and everybody was there but now it’s just younger kids that are fighting and I fealt like I needed to turn pro. My first fight, I probably wasn’t that ready. But now I feel ready, more developed and more determined. DS: Do you feel any pressure because of what your brother has accomplished? Caballero: Not really, I don’t feel any pressure. It feels different this time, knowing that my brother isn’t on the card but maybe everybody will see me and see how I fight. Maybe a different style will be more exciting. DS: Would you say you have a fan-friendly style? Caballero: Yea, I’m a boxer and a brawler. However the guy comes out, I can go at it. DS: Anything you’d like to say to your friends and family? 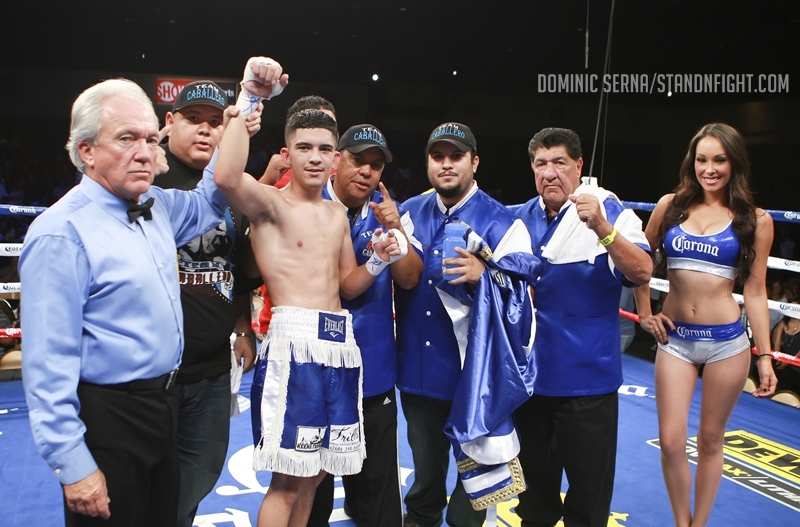 Caballero: I hope everybody can make it out to the fight to support me. (1-0) Ryan Caballero looks to secure his second victory this Saturday on the undercard of Chris Arreola vs. Seth Mitchell at the Fantasy Springs Casino in Indio California. The card will also feature the return of Rafael Marquez taking on Efrain Esquivias in the co-feature. Doors open at 4:00 p.m. PT and the first fight begins at 4:05 p.m. PT. Matthysse: We are going to beat each other up!